On the accession of Queen Elizabeth II in 1952 new high values were required. The Festival high values of King George Vi were issued in 1951 and included pictorial designs. The GPO decided to continue using pictorial designs and feature castles, one from each region. Various essays were submitted. Due to delays in preparing acceptable designs the stamps were not issued until 1955. Waterlow printed the first stamps in 1955. The contract was transferred to De La Rue in 1958 who printed the stamps until 31 December 1962. From 1 January 1963 the printing contract was taken over by Bradbury Wilkinson who printed the stamps until they were replaced by the Machin head design in 1969. The exhibit covers the preparation of the issue and the development of the three printers. Usage of the stamps on registered mail, telegrams, bank mail and express delivery is included. The exhibit illustrates some of the problems encountered by the printers and the errors that resulted. Some of the information already published regarding this issue is incorrect or incomplete. The information has been updated through research into the GPO and printers' files and the examination of the existing printing plates at the British Postal Museum and Archive and is illustrated in the exhibit. Waterlow and De La Rue placed markings in the margins as a guide to positioning the perforator. These guide markings differ between the two printers and were also changed during each printing contract. A pattern has been established in the change of these perforation guide markings, particularly in the case of the De La Rue printings. Through these changes it has been possible to examine the evolution of the different settings of the perforator which can be used to identify individual plates in many cases. Bradbury Wilkinson inserted plates numbers on the issued sheets and are included in the exhibit. Waterlow and De La Rue altered the method of preparing the printing plates during their contracts. In the case of the Waterlow printing only the 2s6d value was changed but all values were affected in the De La Rue printings. 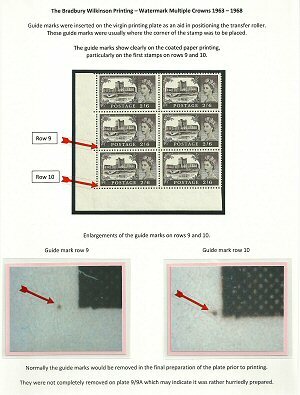 The perforation guide markings serve as an aid to identify these changes. Bradbury Wilkinson uaed the same method to prepare the printing plates throughout their contract. "The Queen Elizabeth II Waterlow Castle High Values 1955-1958" by Gerry Bater and The Lord Spens, published by the G.B. Overprints Society.